Origin of the name : Peshawar has long been known as"the Frontier-town . Standing right at the mouth of the world-famous Khyber Pass, it holds the key to the gateway of the sub continent of Pakistan and India. For the British it was the headquarter of their North West Frontier Province. 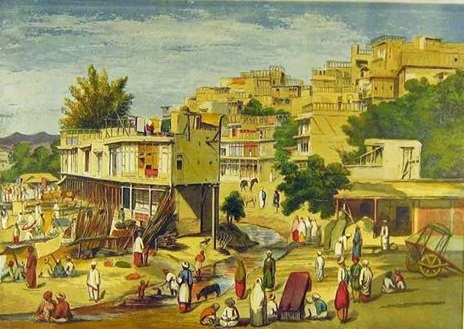 For those coming from the side of Kabul, for instance, the Durranis and the Mughals, Peshawar was the first city that they met on their way to Hindustan (India of yore) and hence, according to some , the name is derivable from the Persian Pesh awardan. 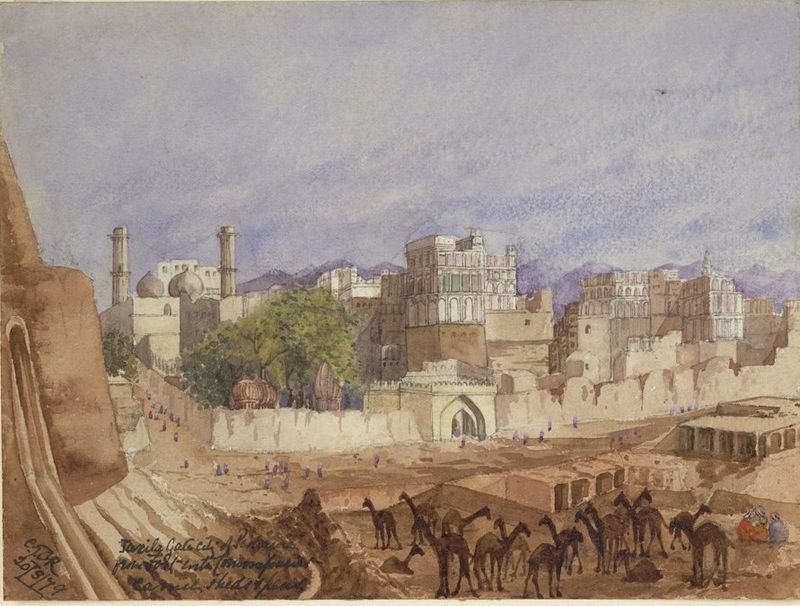 The Mughal' emperor · Humayun regarded he holding of Peshawar as a real beginning to the conquest of lndia . it was Cunningham , who first suggested that the"present name we owe to Akbar (Humayun's son), whose fondness for innovation led him to change the ancient Parashawar, which he did not know the meaning, to Peshawar." His court historian, Abul Fazl , uses four forms---- Parshapur , Parashawar, Peshawar (پیشاور) and Pishawar (پشاور) in the Akbarnamah. Babar  always spells the word as Parashawar ;while Abdul Fazl  gives the form Farshabur . As early as the eleventh century A. D. Alberuni records two variants-----Parshawar  and Purshur . In the seventh century the Chinese pilgrim, Hiuen Tsang writes Po-lu-sha-pu-lu' , while another traveller Fa-Hien, in the fifth century, gives the name as Fo-lu-sha .. All these are variants of one and the same name, which, in one of the local dialects, is pronounced as Pekhawr. The old Gazetteer  records a Hindu tradition that the name Parashapur is after a Hindu king, called "Purrus"or. "Purrush," and hence the meaning "is simply the seat of Purrus or Porus". But we have no evidence of the existence of such a Hindu king. However, the Persiang  (both the Achaemenians and the Sassanians) are known to have exercised long sway over this region. The'Achaemenians particularly assumed the title of"Lord of Parsa "(i. e. King of the Persians), and it will be no wonder if the name Parshapur is due to them. The oldest name has been traced in a Kharoshthi records  found at Ara near Attock, dated in the (Kanishka) year 41 (A. D. 119), where it is spelt as Poshapura · a. Dr.Sten Konow rightly rejects the pedantic original Purushapura and argues that Posha represents Paushpa, from · the Sanskrit word Pushpa (meaning. "Flower"), : If this suggestion is correct, the word would mean "The City of Flowers" -----a name which the place really deserves. But the persistence of the form Parsha in all the literary accounts-would argue in favour of its connection with the Persians who have all along exerted a strong cultural influence in this region. Meaning of Bagram : Abul Fazl  gives Bagram or Bigram as a second name of Peshawar, and as he uses the latter for the city as well as for. "Wilayat-i-Peshawar"" , he observes that,"The Tuman of Bigram is called Parashawar , He further adds,"In Kabul as well. As in Samarqand and Bokhara, a Parganah which comprises towns and villages is called a Tuman'': Gopal Das  records a tradition that a Hindu raja called Bigram (correctly Vikrama) rebuilt the city and named it after him. But this tradition is imaginary as the king Vikrama himself. Charles Masson  derives the word· from the Turki bi or be"chief "and the Hindi gram. Cunningham  takes the word to mean"the city", par excellence and traces it from the Sanskrit Vi and grama. According. To him"it is also applied to three other ancient sites in the immediate vicinity of great capitals, namely , Kabul, Jalalabad and Peshawar.". It seems, however, that the name consists of two original Sanskrit, words Vara (best) and grama (village). In courseof time Varagrama got corrupted into Bagram. There are other villages in this region which bear the name of Baragram or Batugram. 3- Munshi Gopal Das in Tarikh-i-Peshawar, p-141. He gives two other meanings---(1) Peshah war, i.e full of artsians, and (2)Pashah war i.e full of creeping insects. 8-Al-Kamil al-Ibnal-Asir, Pt-XII, p-99. This spelling is due to the use of the Arabic language in which letter p is absent. 9-Alberuni's India, Tr. by E.C Sachau, Vol.I, pp.276, 348 and 427. 16- We have other instances of Indian Capital cities called by such a name e.g Pataliputa as Kusumapura and Kanauj as Pushpapura.